How Do You Know if You Need New Gutters for Your House? If you live in St. Charles, St. Louis or anywhere in Missouri, you know that your house is bound to be hit with a ton of rain, hail and snow. That’s why it’s essential that your gutter effectively diverts the water and melted snow away from your home’s roof so that moisture doesn’t seep into the structure. The average gutter will last about 15-20 years, though that timeframe will be shortened if you live in a climate that experiences severe weather. Because of the location of gutters on the roof, you might not be able to see if they have become damaged, so be sure to have a professional examine them (along with your whole roof) on a regular basis – and especially after a storm or heavy rain- or snowfall. As with most things, paying someone now to ensure that your gutters are in perfect working condition will save you a larger sum of money (not to mention time) down the road if they cause damage to the roof, interior of your house, or landscape. If you are checking your gutters on an annual basis, you will become familiar with how your gutters look, and therefore will easily recognize when something doesn’t look right. If you see water stains beneath your gutters, that’s a sign that they are leaking or have become clogged and water is spilling over the edge. This is a must-fix as water damage can rot the fascia and cause even more damage. If you see that your gutter is sagging or you notice any cracks or rust on it, then it’s time to replace your gutters. If the crack or sag is minor, it may be tempting to put off any repairs, but small cracks in inclement weather will quickly turn to big cracks. As with clogs, any cracks, sagging or rust will prevent the gutters from working efficiently and eventually lead to leaks, which cause even more damage to the roof, siding, foundation and interior of your house. Your gutters are painted with waterproof paint which is meant to hold up in all kinds of weather. If you see peeling paint on or near your gutters, your gutters might just be really old. But if your gutters are not that old and you see peeling paint, then that’s a sign of water buildup in the gutters. In addition to peeling paint, you may see orange flakes which likely indicates rust. 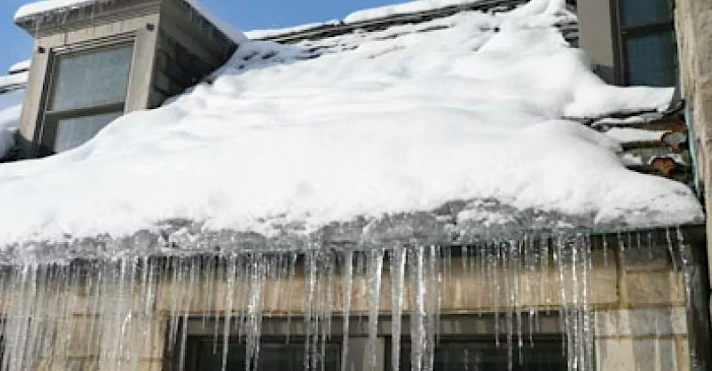 In geographic locations that experience freezing winters, your gutters might suffer from ice dams, which are ridges of ice that form on the gutters or roof’s edge and prevent the melted snow from properly draining. When water can’t drain, the ice dam will lift the shingles and the water will become trapped underneath and eventually leak into the house. Ice dams can also weigh down the gutters and detach them from the roof. Generally, the more shallow the pitch of the roof, the more likely it is that ice dams will form. If you are experiencing a leaky ceiling inside your house, check up where the ceiling meets the wall. If the leak is coming from this location, the cause may very well be a damaged gutter and not necessarily a leaky roof. At Signature Exteriors we are experts at installing well-designed and durable gutter systems that will last as long as your house does. We work with you during the whole process to ensure that you are absolutely satisfied – and we offer a limited lifetime warranty! Ready to get started on your gutter project? Call us right now for a free inspection and estimate at (314) 827-5376 — we’re always happy to answer any questions you have!